Agnes Pearce Matthews, RN retired, age 90, passed away on Monday, June 08, 2015 surrounded by her loving family. Agnes was born in Northampton County on April 16, 1625. She was the daughter of the late Luther Franklin Pearce, Sr. and Mariam Wheeler Pearce. She was a 1947 graduate of Parkview Hospital Nursing School. 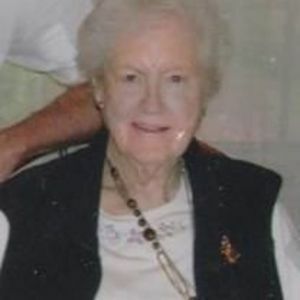 She is preceded in death by her devoted husband of 65 years, David Earl Matthews, Sr; brother, Luther F. Pearce Jr. and four sisters, Ethel P. Futrell, Betty P. Haynie, Julie P. Sumner and Sally P. Kidd. Left to cherish her memory is her loving children, David Earl Matthews, Jr. and wife Lynn of Raleigh, William F. Matthews and wife Melinda of Rocky Mount and John T. Matthews and wife Diane of Battleboro; five grandchildren, Mandi Matthews and Casey Matthews, Abby Prescott, Greg Wagner and Trampas Swanson; three great-grandchildren, Alex and CJ Prescott and Grace Swanson; and numerous cherished nieces and nephews. The family will receive friend on Tuesday, June 9, 2015 from 6:30 PM until 8:30 PM in the chapel of Johnson Funerals and Cremations, 661 English Road, Rocky Mount, NC 27804. A memorial service to remember Agnes will be held on Wednesday, June 10, 2015 at 2:00 PM in the chapel of Johnson Funerals and Cremations with Re. Larry Curtis and Howard Kendrick officiating. The family would like to thank the staff of The Cottage at Spring Arbor for their wonderful care the past four years as well as Community Home Care and Hospice for their recent care of their mother. In lieu of flowers, you can make memorial donations in Agnes’s honor to Community Home Care and Hospice at 3124 Zebulon Road, Rocky Mount, NC 27804 or to the charity of one’s choice.